Northern Army Commander Lieutenant General Devraj Anbu on 31 may complimented the Indian troops for their alertness and synergy with other security forces, which resulted in successful operations including the recent counter terrorist operation, in which Hizbul Mujahideen commander Sabzar Ahmed Bhat was killed. 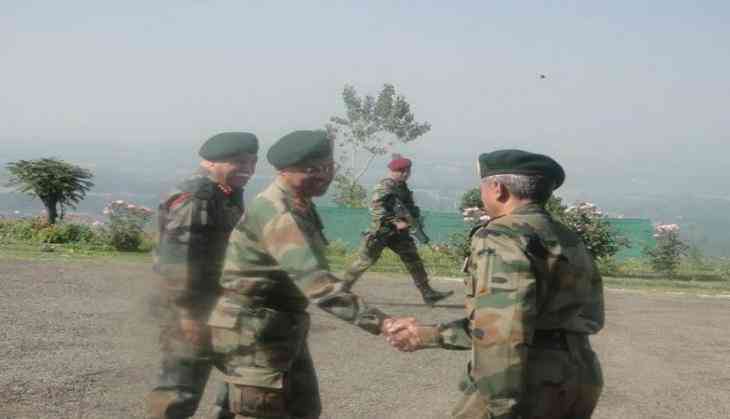 General Anbu visited the Army formations and units in South Kashmir, where he was briefed by the field commanders on the prevailing security situation and the measures instituted to ensure peace and calm. The Commander along with his Chinar Corps counterpart Lieutenant General J.S. Sandhu, also took stock of the security and administrative arrangements for the Amarnath Yatra which is scheduled to commerce from June 29. He stressed upon the need for close coordination with Civil Administration to ensure a smooth and efficient conduct of the Yatra. The shutdown which was imposed in Kashmir, following the killing of Sabzar Bhat who was killed by forces during encounter at Tral, has finally been lifted on 31 may after three days of restrictions. The separatist leadership had given the shutdown call against this killing and the authorities imposed strict restrictions at vital places in Kashmir Valley to stop protests. The traffic played normally on all routes and all the shops and business establishments functioned normally after the three days of restrictions and shutdowns. The government offices, educational institutions, banks, courts and markets also resumed to normal work on 31 may. Unrest stirred again in the Valley after Bhat's killing, as locals took to the streets and clashed with the security forces to express their anger over the killings. The curfew was announced in parts of Srinagar falling under the jurisdiction of eight police stations including Kralkhud, Khanyar, Rainawari, Safa kadal, Maharaj Gunj, Maisuma, Batamaloo and Nowhatta. The authorities also ordered closure of schools and colleges in Srinagar district in the wake of protests and clashes witnessed in various city schools and colleges. The death of Sabazar Bhat, who succeeded Burhan Wani has triggered protests, shutdown and curfew like situation. The Tral operation was a coordinated effort of the Rashtriya Rifles (RR), the JKP, Special Operation Group (SOG) and the Central Reserve Police Force (CRPF).